A tracheotomy is a potentially life-saving surgical procedure. During a tracheotomy, an opening is made in a patient's windpipe to relieve airway obstruction. A tube inserted into the trachea through the throat allows breathing to continue through the tube and bypasses the mouth and nasal passages. After the emergency has passed, the tube can be removed and the opening closed. 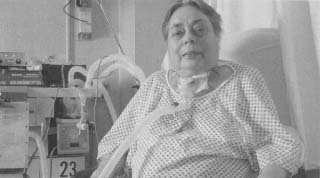 A tracheotomy patient. Tracheotomies are used today to treat choking victims, as well as patients with severe burns, respiratory infections, and cancer. of membrane-like throat obstructions). Although Bretonneau had previously attempted two failed tracheotomies, his determination, skill, and dexterity paid off when he saved the girl's life. Tracheotomies are used today to treat choking victims, as well as patients with severe burns, poliomyelitis, respiratory infections, and cancer.